Several of the Haloran Family decide to visit the families country estate which is now where the eldest son currently resides with his new wife. They are visiting to honour the memory of their youngest daughter who drowned in the lake by the house. Now, like every family, they have their secrets. The secrets will come back to haunt them when a killer shows up at the estate and starts picking off the family one by one. 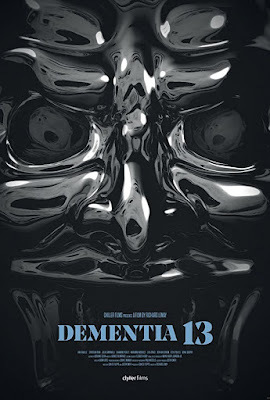 Going into Dementia 13, the only thing that I knew about this film was that it was a remake of the Francis Ford Coppola movie. You know, the man that gave us Dracula, Apocalypse Now, and The Godfather Trilogy. At the beginning of his career, the man directed a proto-slasher. This is the only thing that I knew about the remake. Due to not seeing the original, I have no basis for comparison between the two films. I can only think that if the remake is anything like the original, Francis Ford Coppola went onto bigger and better things. 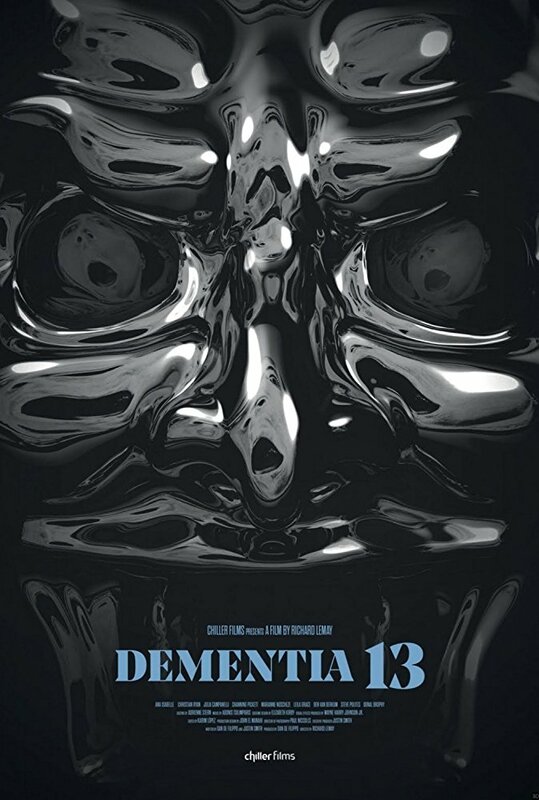 Dementia 13 is an odd one. The story feels very fractured and almost non-linear, at first. That is until things start unravelling and the sort-of-twist is revealed at the end. For the first hour and ten minutes, I was wondering what the hell was going on in the story, as it feels like three separate storylines which finally come crashing together in the end. While they end up making some form of sense, it still felt a little all over the place for the first hour of the film. The story itself starts out with a woman who looks like she is being emotionally and physically abused by her husband. When she decides to finally fight back, it appears as if she is our protagonist. Cue to her being brutally murdered with an axe just a few minutes later when the family storyline comes into play. It's a bit of a jarring moment as I was expecting one thing and something entirely different happens. At first, I was onboard with this early storyline. It's when the family come into play that things sort of spiral out of control. Right up until the final twist, this family is all over the place. We get vengeful ghosts, a masked killer who is picking the family members off one-by-one, and awful acting. With every member of the family containing a secret. Not one of them is likeable. So as the family are being killed off, we really have no one to root for here. It's as if the writers wanted us to hate every single person here and for the most part, we really do. Even our abused wife who turns out to be a gold-digger in a later reveal. It's a very odd choice to not have a proper hero and everyone as a villain. The story almost feels like they were trying to replicate the success and feel of You're Next without any of the cleverness. A family comes to a rural estate. A killer shows up and starts murdering people. It felt similar, but the storyline involving the ghost takes it out of that grounded reality. I think had the story just been about a family who was there to honour the memory of their dead daughter, and a killer is killing off the entire family to obtain the inheritance and estate, it would have played much better for me personally. I'm not sure if the original film plays the same way. When it comes to the twist of the killer's identity, it felt predictable. With the way, the story plays out, it could only really be this one person. From the outset, only one real character has any motive to kill, and they are the worst of the family. When they are seen being killed, it's never actually confirmed. So for the entire running time, I was just waiting for this person to pull off the mask and when it happens, I wasn't at all shocked by the reveal. It was actually a little disappointing, to be honest. When it comes to the cinematography and location, I think the film looked great. The country-side manor is gorgeous. The estate is castle-like, and while they don't use it for any really great chase scenes, it's a nice place to house all the characters. I think the director does try to deliver a few well-done camera shots and angles. I can't fault them for at least trying to provide a decent looking film even though the budget was probably quite minimal on this slasher. Lastly, we come to the gore and bloodshed. I love that the director has chosen to go with practical gore effects over computer-generated. It makes the death scenes a lot more enjoyable when we are watching a woman take an axe to the chest, or a bloke being repeatedly smashed in the face with a wooden oar. I think minus a few cheaper looking gore makeup effects, most of this movie seems very well done, and we get a few bucketloads of blood splashed about in the film. On the carnage candy front, I've got no real complaints. - A man and woman are strangled and choked to death. - A woman falls over and hits her head on a rock. - A man's head is beaten in with a hammer. - A man's head is smashed in with an oar. - A man is hit in the back with an axe. - Several men are shot in the head. - A woman is hit in the chest with an axe. - A guy is shot in the chest and stomach. - A woman dies after being shot in the back. - A woman is dragged into a lake and drowned. Being a remake of the Francis Ford Coppola slasher from the early sixties, I'm sure a remake comes with some hesitance from fans of the director. How do you follow that up such from such an iconic filmmaker and provide your own vision? Luckily for me, I haven't seen the original. So I went into this remake with an open mind. Sadly, this is a movie that misses the mark. A supernatural slasher with some pretty terrible acting and a predictable third act drag this story down. All is not lost though, go in for all of the gory practical effects and you might come out surprised.